Along with Hyderabad Nizam's gold tiffin box, a ruby-studded cup and saucer, and a spoon, have been stolen. 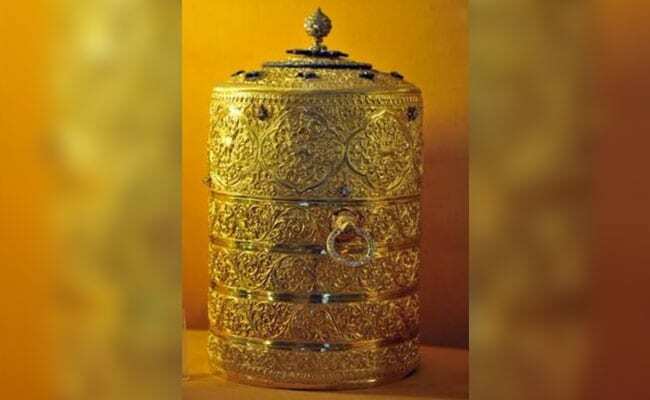 New Delhi: A precious gold tiffin box, belonging to Hyderabad Nizam was stolen on Sunday night from the city's "Nizam's museum". Along with the box, a ruby-studded cup and saucer, and a spoon, have been stolen. When the officials returned on Monday morning, they found the items missing and informed the police. Police say that burglars may have broken window of the chimney, which is about 4-feet wide before breaking the glass and getting onto the first floor of the museum. Police sources said that the burglars moved away the CCTV cameras in other direction, therefore not much has been captured in that. They also suspect that it could be an insider's job. They also said the security was inadequate at this palace. 10 teams have been formed to catch the burglars. The premises have been sealed to prevent any loss of evidence. The precious gold tiffin box weighs 2 kg and is studded with ruby, emeralds and diamonds. The antique belonged to the seventh Nizam, Mir Osman Ali Khan, the ruler of erstwhile Hyderabad state between 1911 and 1948 until the time it was annexed by India. The antique tiffin box was on display in Hyderabad's Purani Haveli, one of the palaces of Nizam in the old city area. According to Saifulla, a historian who has studied Nizam treasure, said that the Nizam's gold tiffin box's market value could be more than Rs 60 lakh. Along with other artefacts, the total value could be more than Rs 1 crore, he said. The galleries at the Nizam's museum stock silver and gold artefacts and replicas of landmark constructions.